(Glenn’s Tech Insights used to be part of our bi-weekly newsletter but we decided to make it a regular blog post instead so it can get more visibility. It covers interesting new hardware and software developments that are generally relevant for SQL Server). Market analyst firm DRAMeXchange, expects DDR4 Server DRAM prices to decline by roughly 30% in Q1 of 2019. They also expect another 15% price drop in Q2 of 2019. DRAM inventory levels have been climbing since Q4 of 2018, and most DRAM suppliers are holding a huge six weeks supply of inventory. This trend is should continue until at least Q3 2019. Intel has 14nm manufacturing bottlenecks that are causing a shortage of processors for some parts of the processor market. This has the effect of depressing demand for DRAM, which puts downward pressure on DRAM prices. This Intel CPU shortage will probably continue for the rest of 2019, even after Cascade Lake-SP is released. This is especially good news if you are planning any new database server purchases in the coming year. Ideally, you would do this as part of a data platform upgrade. Checking Crucial.com today, I see 32GB DDR4-2666 RDIMMs selling for $275.99, which is $8.63/GB. That is the lowest pricing that I have seen in 2-3 years. This makes it much less expensive to get an appropriate amount of memory for your database server. 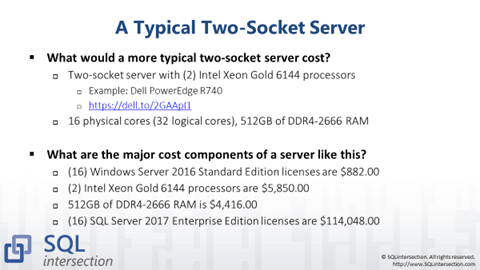 For example, for a typical two-socket server with 512GB of RAM, sixteen 32GB DIMMs would only cost about $4,460.00. This is nearly a 50% reduction from about a year ago. 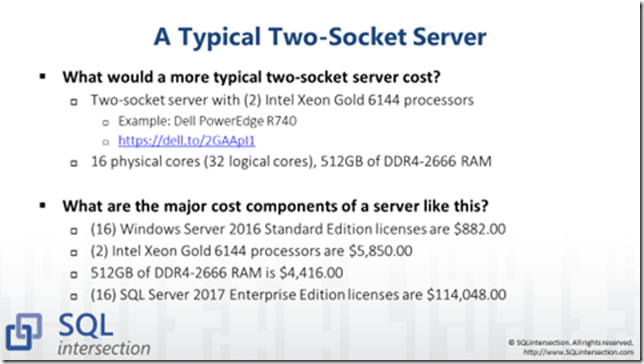 As you can see in Figure 1, the cost of an adequate amount of memory is now one of the lower contributors to the total cost of a database server. AMD recently had a special presentation for investors, where they revealed some more details about their product roadmap. This included some rough release dates for several upcoming product lines. These include the 2nd generation Ryzen Pro mobile processors, 3rd generation Ryzen desktop processors, and the 3rd generation Ryzen Threadripper processors. The fact that AMD included the 3rd Generation Ryzen Threadripper processor family of this roadmap very likely means a release date in 2019. The 7nm 3rd Generation Ryzen desktop processors� have been rumored to be released on July 7, 2019. I am looking forward to the release of the 7nm 3rd Generation Ryzen Threadripper processor family later in 2019. When that happens, I should be able to do yet another CPU upgrade on my existing system. Alternatively, I may be able to build a completely new system with a new motherboard using an X499 chipset (which is only a rumor at this point). There was talk of the X499 chipset being released at CES 2019, but that didn’t happen. If it does happen, I would expect improvements such as PCIe 4.0 support, Thunderbolt 3 support, and better USB connectivity. This is pretty exciting stuff if you want to see a viable competitor to Intel, both in the mainstream desktop and HEDT space. What do you think about this? I would really like to hear your thoughts! By design, the system used 100% PCIe 3.0 NVMe NAND flash or Intel Optane storage. All AMD Ryzen Threadripper processors support 64 PCIe 3.0 lanes (with 4 reserved for the chipset), so I wanted to take advantage of that to get excellent total storage performance. This system has 16 physical cores (32 threads), 96GB of RAM, about 3.7TB of storage, and 10 Gbps Ethernet connectivity. It has two empty memory slots, so I can easily go to 128GB of RAM. 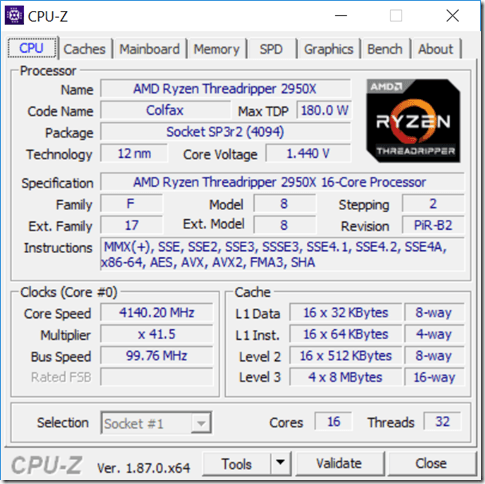 On August 31, 2018, AMD released the second generation 12nm AMD Ryzen Threadripper 2950X processor (AnandTech has a great review here). This processor uses the improved Zen+ microarchitecture that offers the Precision Boost 2 and XFR2 features to more aggressively boost more processor cores more quickly, based on available voltage and operating temperature. 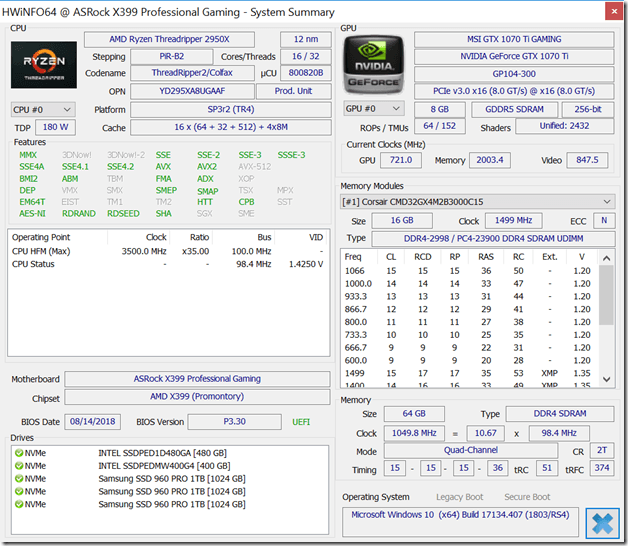 There is about a 3% IPC improvement and some minor base and boost clock speed increases. After waiting a bit, I managed to find an “open-box” special for an AMD Ryzen Threadripper 2950X for $765.00 at my local Micro Center, where it looked like someone had purchased the processor, opened the box, but they had not actually installed the processor (since it had no thermal grease residue or even any fingerprints on the heat spreader). Normally, Micro Center sells that processor for $849.99, which is $50.00 less than Newegg or Amazon. While I was at it, I swapped out the original NZXT Kraken X62 CPU cooler for a Noctua NH-U14S TR4-SP3 CPU cooler, that was actually made for the huge Threadripper CPU size. This Noctua cooler is quieter than the old cooler, and it keeps the CPU roughly 20 degrees Celsius cooler, both at idle and under a full load. The temperature difference is important for the XFR2 feature, which boosts the clock speed of more cores more aggressively if you have a high-end CPU cooler. The CPU-swap went even more smoothly than I expected. The hardest part was removing the old NZXT CPU cooler and its associated wiring. I was expecting to have to go into the BIOS setup during the first boot and confirm a CPU change, and then I expected that Windows would also want a reboot. I also thought I might even have to re-activate Windows 10 because of the new CPU, but none of this was required. The system booted right into Windows 10 Pro for Workstations with no complaints at all. Here are the old and new CPU-Z and Geekbench 4 scores for this system. Economically, its hard to make the case for this particular upgrade. If I sell the old Threadripper 1950X, that would make it much easier to justify. 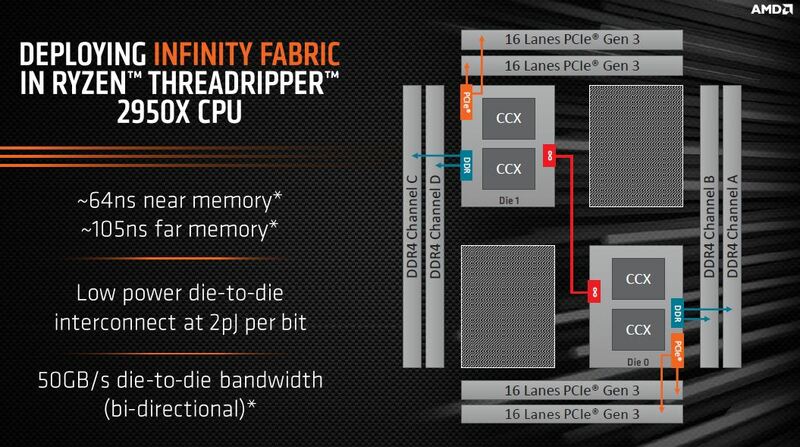 Another argument is that AMD is planning on maintaining full backwards compatibility with existing AMD X399 motherboards when the 7nm Zen 2 Threadripper processors are released in mid-2019. Here is an AMD diagram of the architecture of the processor. I really think that an AMD Threadripper system is the best choice for a general purpose, HEDT workstation, especially from a performance/dollar perspective. Intel still has a small single-threaded performance advantage with some of their processors, but the gap is pretty close now. You will have to spend quite a bit more money to get a comparable Intel-based system.